Nobel Laureate Joseph Stiglitz discusses his new book about how the euro now threatens Europe's future. The eurozone project was “flawed at birth” notes a new book by Nobel Laureate Joseph E. Stiglitz, the former chairman of the Council of Economic Advisors under President Bill Clinton who teaches at Columbia University and is a columnist for The New York Times. He also was former chief economist for the World Bank. 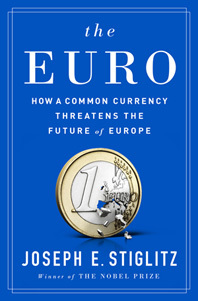 In The Euro, How a Common Currency Threatens the Future of Europe, Stiglitz outlines the key problems in how the eurozone was structured, and how the politics of yesterday — and today – are smothering economic growth and causing deep social problems and steep unemployment, eight years after the financial crisis. He also offers some ideas for making improvements. Knowledge@Wharton spoke with Stiglitz about his book, published this month, and about how the dominant economic consensus of the last 30 years is fast crumbling on the Knowledge@Wharton Show that airs on Channel 111 on SiriusXM. Knowledge@Wharton: Brexit has [raised] many questions [about] both the European and global economies. There have been several occasions during the run of the European Union when the question has arisen as to whether this partnership between its countries and regions would come apart at the seams at some point. But first, I’d like to know whether you were surprised as to how [the Brexit] vote went. Stiglitz: Remember, everybody thought it was going to be 50/50. They thought in the end that [Britain] would stay in [the European Union]. They underestimated the magnitude of the discontent. And the kind of discontent we’ve seen in our primary season in both the Trump and Sanders supporters. Given that level of discontent, which took the establishment of the United States by surprise, maybe the outcome of the Brexit vote is not a surprise. You also write that since the financial crisis in 2008, things that should have gone down are up and things that should have gone up are down. So debt is up, absolutely, and relative to GDP in many countries. Inequality is up. You also note the social pathology [trends] — suicides are up. There is a lot of suffering out there with unemployment and so forth, but incomes are down. Could you talk about the aspects that are up that should be down and vice versa? Stiglitz: The striking thing is that the crisis of 2008 originated in the United States. Normally, you would say the country [where] the crisis originated should be the one that symptomatically is worse off and ought to have the hardest time recovering. I wouldn’t say we’ve had a full recovery but we’re doing pretty well. In Europe, that’s not the case. There’s a high level of unemployment. Youth unemployment is very significant, [which in Europe is] twice that of the average unemployment. In the “crisis countries,” the numbers are unbelievable. The [economic downturns] in these countries are greater than the Great Depression. Greece is the worst example where GDP is down by 25%, unemployment is 25%, [and] youth unemployment is over 60%. It’s a poster child of what should not have happened. Interestingly, while the Troika, the group partnership between the European Central Bank, the European Commission [and] the IMF (International Monetary Fund), focused on getting debt down and pushing austerity to limit what governments spend, these countries have wound up with increasing debt/GDP ratios, so [they have] less debt-sustaining ability. The reason is very simple. The debt/GDP ratio has two numbers — the debt at the top and GDP at the bottom. And what they did is they shrank GDP. If you shrink the GDP, the debt/GDP ratio goes up and the debt becomes unsustainable. [The Troika] focused on the numerator on debt and paid no attention to how [their] policies were going to shrink the economy. I should qualify that. Their theory was that what they were doing would expand the economy, but that theory, called austerity, has been discredited. It was what we tried in the United States under Herbert Hoover. Yet they went ahead and believed in that policy. And those of us who said it was wrong — said it was wrong when it was tried in East Asia by the IMF, said it was wrong in Argentina — have once again been proven right. The really interesting thing to me is that even the IMF now says that contractionary policies — austerity is contractionary and leads to reduction in GDP. It’s only Germany, the European Central Bank and the European Commission that persist in this ideological view that these policies would work. Knowledge@Wharton: The problems that you point out in Greece and some of the other European countries persist eight years after the financial crisis. Usually, [following] a recession, you have some kind of spontaneous recovery after three, four or five years. Knowledge@Wharton: Eight years later I would think somebody has some explaining to do. I’d like to talk more about the larger economic ideas that you’re getting out there. But before we get to that, if we could focus just a little bit longer on Europe and the austerity policies. Interestingly, some of the European countries, say in the north for the most part and Germany in particular, took a stand of blaming the victims. You write that [while] Germany and others have sought to blame the victims, these countries suffered as a result of flawed policies and the flawed structure of the eurozone. So it’s not just that, in your opinion, they have the wrong policies. They’re actually blaming the victims of these wrong policies. Stiglitz: That’s right. There are two points in that sentence that you read. The first is that they say, ‘Look, these countries misbehaved [and were] profligate, and they’re only getting their just rewards.’ The fact is that Ireland and Spain — two of the countries that went into deep crisis — actually had a surplus before the crisis, no deficit and a very low debt/GDP ratio. That crisis caused their current situation of deficits and debt, not the other way around. So it was so clear that their analysis of what would lead to success was absolutely wrong. The critical point that I make — and this is where I differ from a number of other people who’ve studied what has gone on in the eurozone – is the broad agreement that something is wrong as you said after eight years of this kind of stagnation. Some people say it’s just the policies. If only we had not allowed Germany to dictate the terms. If only we had had better policies. One of the main thrusts of my book is, no, it’s the structure, it’s the design of the eurozone itself [that is to blame, and] that the best of economic policymakers would not have been able to manage Europe through these difficulties. The outcomes would not have been as bad as they have been in Greece — that was a real policy mistake. But the best economic czar would have found himself in a situation of failure. Knowledge@Wharton: Let us take a simple illustration of one of the basic economic problems you point out. A country [facing] economic difficulties [could do] different things. They can lower interest rates. The government can spend more money. Another common tool is to have a devaluation, which may be brought on by the markets themselves if the economy is not doing well. This is a tool that is taken away from countries in the euro — they don’t have control of their currency. So a country like Greece, [or] Italy, [have] currencies that aren’t going down, which presumably would stimulate the economy [if there could be a devaluation]. Is that the kind of structural inflexibility you’re talking about? Stiglitz: Exactly. But they compounded that with two more structural features. They took away these two instruments of adjustment. Then they said to the central bank, ‘You should focus on inflation; unemployment is secondary.’ So Europe goes into this deep recession and in 2011 the European Central Bank somehow thinks that there might be an increase in prices, even though the region is in recession, and twice raises interest rates. That shows you another structural problem. They said, ‘Oh, our mandate is just to focus on inflation. Somebody else has to worry about unemployment.’ But of course, who’s going to do that? Then they tied the hands of the countries and said, ‘You can’t stimulate your economy through fiscal policy, that is through spending money or through tax cuts. You can’t have a deficit.’ So, they took away the fiscal instrument. They took away the monetary [policy tools] — they took away the interest rate [tool]. They took away the exchange rate [mechanisms]. And they put nothing in its place [for each tool that was taken away]. This is what I mean when I say the structure of the eurozone — the design meant anybody who wanted to bring Europe to full employment would have to violate [or] change one or more of those parameters. Knowledge@Wharton: You point out ironically that this almost obsession with reducing debt and worrying about inflation, which was supposed to reduce the amount of debt, in many cases increased the amount of debt — and as a percentage of GDP. In other words, [the Troika’s policies achieved] exactly the opposite of what they were trying to accomplish. Stiglitz: That’s right. These policies in many, many ways were counterproductive. Let me give you another example. The constraints on spending were called ‘convergence criteria.’ They were intended to bring the countries closer together. But when you look at the design of the whole eurozone system, it has led, inevitably, I argue, to divergence. The rich got richer, the poor got poorer, the poor got more indebted to the rich [and] the creditor-to-debtor relationship got exacerbated. So rather than bringing the countries closer together, which was their intent and a good intent, they’ve actually moved them further apart. Knowledge@Wharton: Another key point in the book is that the eurozone is facing long-lasting economic difficulty because it created the single currency without also creating the institutions needed to support a single currency structure. Also the eurozone rules and regulations were not designed to promote growth. In the U.S., the Federal Reserve, for example, has a dual mandate. It is supposed to take care of inflation and also be concerned about unemployment, whereas you pointed out that in the eurozone there was [no focus on] growth or unemployment. Their focus was simply on inflation. What could they have done at the outset of the eurozone? How could they have changed the institutions to have made them work better? Stiglitz: There are a couple of things. One of them is that monetary policy should have been more focused on unemployment and growth and not just on inflation. Here, you have to understand what happened historically. When the euro was being created, there was this ideology, this idea that if only you could limit deficits and inflation, the market would take care of everything and you would quickly get to full employment. That idea has now been discredited, but the rules based on those ideas have been embedded into the rules of the euro, so they can’t easily be taken out without the agreement of all of the countries. That is the fundamental structural problem. There are other problems that should have been recognized at the beginning. For instance, when I was chief economist at the World Bank, one repeatedly saw that when countries borrow in a currency not under their control, there are sovereign debt crises. The United States would never have a sovereign debt crisis — we [would] owe money in dollars. If push comes to shove we can always print the dollars to honor our debt. But when Thailand, Indonesia or Korea borrow in dollars and they owe more dollars than they have, they have a problem, and that was the origin of the East Asia crisis. Interestingly and unthinkingly, Europe created that problem for itself because each of the countries was borrowing in a currency – the euro — that it didn’t control. They turned over the control of the currency to Frankfurt. So the kind of institution that is necessary is [one that would make] some way for joint borrowing — like a eurobond, where they borrow as a group, and then each of the countries pays back into the pool. [This results in] some degree of mutualization of debt. That’s another institution that they need. A third institution they need [should take into account that] the [EU] countries were very different at the start, and you needed some way of helping the countries that were behind to catch up. We call those industrial policies. They’re not just industrial policies, they’re really technology policies — policies that help transfer technology from the better, more advanced to the least advanced. Unfortunately, the rules of Europe proscribed that kind of catching-up policy. So they created a framework where money could easily leave Spain and Italy or Greece when there’s a problem, and they had no common deposit insurance that would have stopped it. … That was a force that created divergence. And they had no way to help these poorer countries catch up with the better-off countries, the richer countries. Knowledge@Wharton: In your book, you talked about the inflexibility that the euro places on these countries. It’s a currency peg. Throughout economic history, [currency pegs have] been associated with recessions and depressions, and crises in general, you point out. So that may not have been the best move. It seems like they moved too fast in some areas and then not fast enough in other areas for this project to work with so many diverse cultures and economies. Stiglitz: That’s right. That goes back to your first remark where you said it was intended to promote prosperity and political integration. It was a political project. But the politics were not strong enough to create the institutions that would make it work. They sort of knew this, and they hoped that over time as the euro worked and brought prosperity, there would be a willingness to make the institutions that would make it work better, and that that prosperity would then facilitate political integration. But you can’t base a major reform like a single currency just on hopes. You have to pay attention to economic laws. And that was the mistake. What happened was what many economists predicted, which was when it faced a shock — the 2008 crisis was that shock — it was unable to adjust. That set off the euro crisis that we’ve now had for, as you’ve said, eight years. The consequence of that is that Europe has become more divided. I’ve been going to Europe for almost 50 years and I’ve never seen it so divided. The recriminations between the north and the south have been really, really intense. What is clear is that it actually has precipitated movements towards political disintegration. The failure of the euro helped create the atmosphere which had some impact on Brexit. It was not part of the eurozone, but the massive failure over on the Continent I’m sure had the influence of saying, ‘You know, is that a club I want to belong to? Do I want to belong to a club where one country is telling another country what to do? Not only telling them what to do, but the policies are absolutely wrong. Do I want to be dictated to by Germany?’ And the answer was, clearly, ‘no.’ It fed indirectly into the Brexit vote and thus led to the beginning of political disintegration. Knowledge@Wharton: You do have some ideas of what Europe or the eurozone should do now. You write that right now, unfortunately, all the alternatives are painful and costly, but they could be better than continuing with what they’re doing. You also have this idea of a flexible euro — could you explain that a little bit? Stiglitz: There are two other courses [of action] I talk about. One is finally finishing the project, that is to say, putting in place the institutions that would make it work. That would be the first best solution. It’s not a big deal economically, but it seems to be too big politically. Germany says, ‘we’re not a transfer union … we won’t do anything where we might help somebody else.’ So that’s out of the picture. Then you could have a complete divorce, going back to the world as it was before the euro. That’s a possibility. But there are many people who feel that they’ve actually made some advances in creating institutions that would make a common currency work. Not enough, clearly, but they’ve made some advancements. Let’s take advantage of those. This is where the idea of a flexible euro [comes in]. It says, ‘Let’s create maybe a northern euro, a southern euro, maybe a German euro, and two, three, four different euro currency areas. Let’s create institutions that facilitate coordination and help limit the range of variability of the exchange rates with each other.’ I describe how to do that. Over time, if these institutions work in the way they’re supposed to, the variations of these exchange rates with each other become smaller and smaller. At some point, Europe can say, ‘Look, we’ve proved that we’ve created the institutions that will enable a single currency to work like the United States — [which] has a currency that works for 50 diverse states — that we’ve gone far enough, we’ve done it.’ Then we can make the final step to, once again, create a single currency. [Essentially,] they put the cart before the horse. What I want to do is say, ‘let’s pause for a moment. Let’s try to construct the institutions. If we succeed in constructing the institutions and we test it out, we test-drive it, and if it’s working pretty well then we can make that last step. Brexit Breakdown: What’s the Likely Impact? The U.K.'s decision to leave the EU has roiled the markets as uncertainty made investors head for the exits. Wharton professors and other experts discuss the implications of the Brexit vote. As Greece accepts its third bailout, the country's people and government face another round of harsh austerity. But does it make sense to impose such policies on an economy that is already in a tailspin? Very interesting book. Many have talk about this, even Bernanke is agree that Europe was wrong in its fiscal policy and late in his monetary policy. More focus on spanish problems there is also a book called “The Euro is to blame. Economics for Spanish people”. The plight of Europe is a precursor of what will happen here. Our ‘rust belt’ plus regions of NY, NJ, SC, NV, MS, LA, etc., are like Italy, Spain, Portugal and Greece: not enough jobs, not enough productivity to support population living standards. (Not to mention stupid austerity policies of gerrymandered incumbents). The Fed is out of solutions and ammo; QE 2,3, 4 squandered $$Trillions bailing out sick banks and parasitic intermediaries. Increasingly, transfer of key elements of public education, health care, welfare safety nets from the Federal Government to the States, results in Balkanization of major economic elements, and a downward spiral of human capital. Austerity is not to blame. No opportunities for expansion were made. Anti-business, pro-union forces have long passed laws that limit productivity and the generation of new job opportunities. This was seen from the get go and has only gotten worse with the election of leaders such as Hollande. Austerity, per se, hasn’t really been applied to these countries. GDP will continue to go down until the leaders get serious about creating an environment where businesses can invest, create jobs that are productive so they can compete world wide. Are these laws “limiting productivity” or protecting workers from exploitation? I have not read the book, yet, so it could cover the point I wish to make. The benefits the Eurozone countries (EC) has received, mainly as a result of the free trade zones and boarders, have clearly been considered a more beneficial than the problems most of the Eurozone countries (EC) are experiencing? The economic benefits received by the more successful EC’s have been redistributed to the poorer EC’s, in the same way Globalization benefited most of the worlds population. Given the repeat of history, it would be of interest to get the response from the decision makers in the Eurozone, as to why they do not share the views in the book, and their plans for the future. Maybe you can facilitate this.